Mid-Century Modern Italian bedside or table lamps in yellow enamel with brass hairpin bases, perfect for smaller spaces. They will require new wiring for US standards. Gebrüder Cosack table lamp newly refinished and re-wired for U.S. standards. 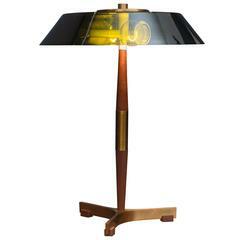 Fog & Mørup manufactured table lamp made from teak and brass with a green glass shade. 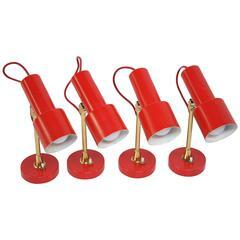 Three or four flea size chips to glass shade edge. Pair of midcentury ceramic table lamps by Wilshire House, Los Angeles. 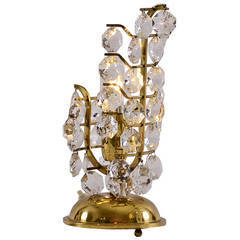 A very nice and well manufactured table lamp with hand-cut crystal hangings, one flame. Unique Bitossi, Italian, Mid-Century Modern table lamp. Cream and Carmel colored incised lamp with crown like top. Marked on bottom. 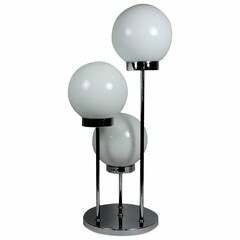 Mid-Century Modern Italian three-globe table lamp, possibly by Reggiani. Measures: Height 29 inches, base 10 1/4 inches, globe diameter 7 inches.